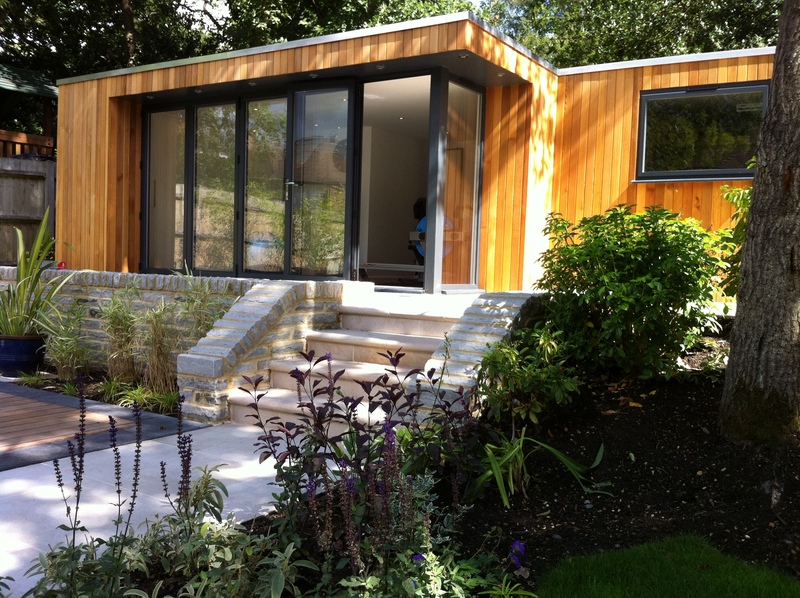 Many of our clients with sloping gardens were worried about what they could do with them. At Accent Garden Designs we are happy to take on sloping gardens and create just as beautiful garden designs as we do with flat plots. In fact a sloping garden can have greater character whether it slopes towards or away from the house. A sloping garden that slopes towards the house creates a theatre stage enhancing the view from the property. Shapes are more prominent and plants can have a stronger background as they are planted against a backdrop of stone rather than colours and shapes being more diluted against the light. This garden drops six metres towards the house. The pleasing shape of the path is stronger due to the direction of the slope. Gardens sloping away from the house offer opportunity to take advantage of a large sky. These allow the designer to create a design taking in consideration the area beyond the garden. This might be a great view or the trees surrounding the garden. Whatever the situation is, the sloped garden looks wider and longer. An example of this can be seen in our last blog where the slope opens up a fantastic view across Surrey. The other challenge is managing the slope itself. The traditional way is using retaining walls to cut into and hold back the soil. These are expensive and generate other issues that need managing such as drainage and access. In extreme cases, this may be unavoidable but with the wall comes an opportunity. 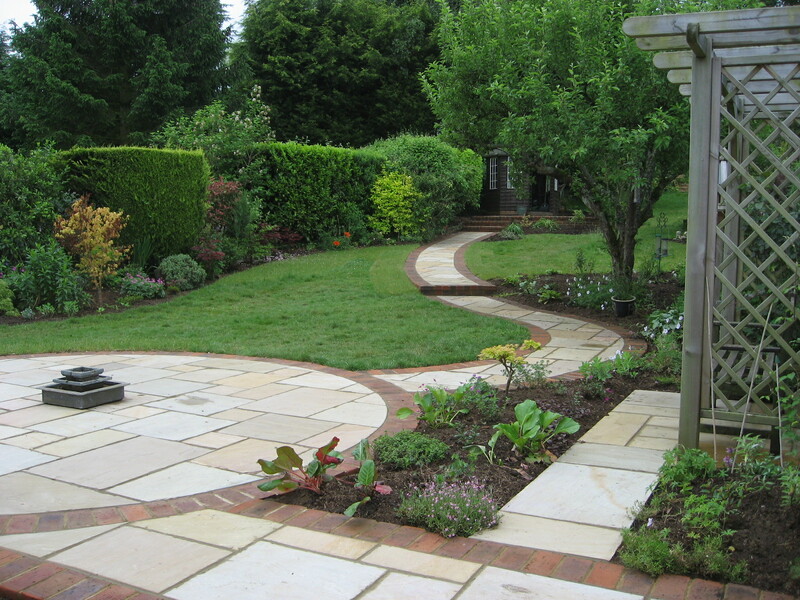 In this example the sloping garden allowed the designer to create three separate areas of the garden. Example of a small retaining wall and sloping beds maximising the positive attributes of a sloping garden. An area immediately by the property for dining; a middle area for play and entertainment and finally the top section which houses a new gym, store room and plant room for the pool. A small uninteresting garden is made to look larger and a lot more interesting. 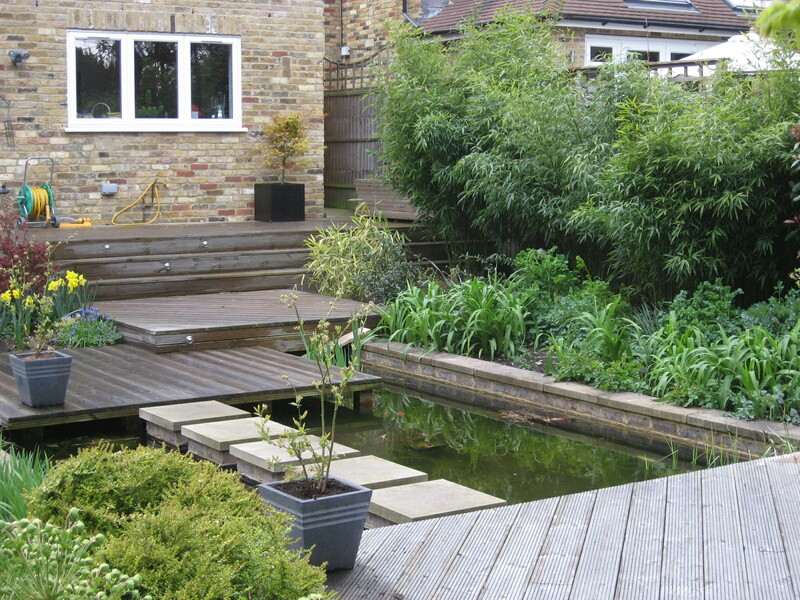 In the example below, the steep sloping garden has been managed by using decking. A series of decking platforms allow the user to descend into the garden comfortably as well as creating interesting areas to sit on etc. Not only is the decking used to create a safe decent into the garden but adds interest at each stage. In this modern garden, the steeply sloping area is also managed through creating several ‘platforms’. This time with stone paving and a fish pond. The modest retaining wall adequately copes with the slope without being obtrusive. In addition, they are extremely comfortable seats enabling the user to sit and enjoy the pond and surrounding planting. Using the slope in this way opens up the area and softens the overall look of the garden. In addition, the careful selection of plants enables us to create a pleasing look as they get established and grow over the top of the wall. Well designed sloping gardens are likely to contain steps and well designed steps are an essential part of the well designed sloping garden. It is key that the ratio between the tread and the riser of the step is accurately calculated. 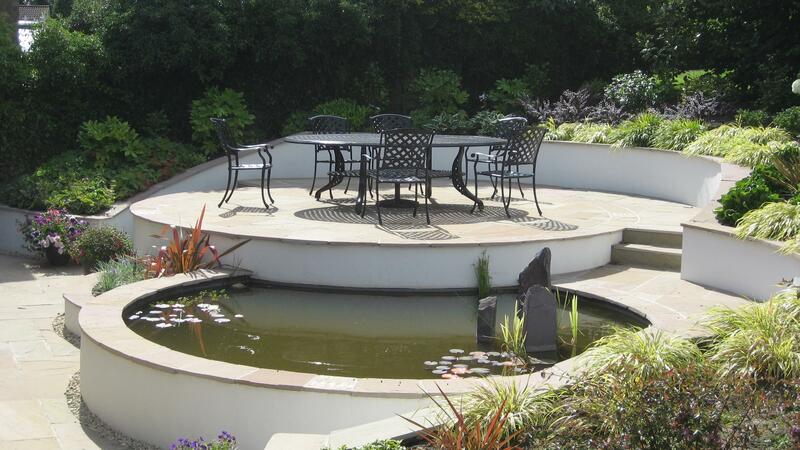 At Accent Garden Designs are proud of the steps we have designed ensuring that they are safe and pleasing to use.